The Inuit peoples living in the Canadian Far North can view the dark night sky continuously for long periods of time. At the North Pole, for example, the Sun rises and sets only once each year. Contrary to popular belief, however, the polar night does not last for six months each year; instead, it lasts for four and a half months. The difference is due to the tilt of the Earth, which causes dawn and twilight to last for several weeks at the poles, thus shortening the duration of the true polar night by six weeks each year. Nonetheless, four and a half months is still a remarkably long night, and one might think that the peoples of the Arctic would have built up an extensive astronomical knowledge base. This, however, does not appear to have been the case. 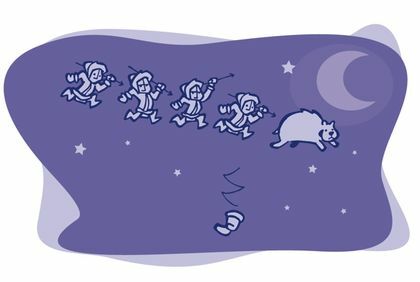 The time during which the northern peoples have access to the starry night sky is actually much shorter than four and a half months, even for the Inuit who live closest to the North Pole. Several factors are responsible, the first of which is the Moon. The Moon rises and sets once per month, and illuminates the sky as it hangs there. The light is reflected off the snow and ice back towards the sky, thus impeding a clear view of the stars. The snow itself is another reason. Swept up by wind, it creates a type of fog that hides celestial objects. Clouds and aurora borealis also mask the stars. Finally, the intense nighttime cold makes observation physically difficult. As such, the Inuit have only two and a half months per year to observe the starry sky if we take into account the presence of the Moon, and only two months per year if we take into account the other factors. All in all, the peoples of the North have difficult conditions to deal with and only a short period of time for studying the stars. The ancient Inuit believed the Earth (Nunarjuaq in the Inuktitut language) to be a flat and stationary body around which celestial objects revolved. It occupied the centre of their universe. The Moon (Taqqiq) was seen as a flat disk of ice, and the Sun (Siqniq) as a ball of fire. The disappearance of the Sun below the horizon for several months was taken as a sign that the cold and frost of winter had weighed it down so much that it could no longer lift itself into the sky. The planets of the solar system were seen as large stars, and the distant stars as holes in the celestial dome. Interestingly, the existence of the North Star – the polar star that remains in a fixed position in the sky and around which all the other stars appear to revolve – appears to have been unknown to the peoples of the North. Only 33 stars were familiar to the ancient Inuit and only six or seven of them were given names. Among them were several that were used for navigation during their travels. As for the other stars, they were grouped into 16 constellations, most of which were associated with myths in which humans and animals played central roles. Below is an example of one such legend from the Inuit of Canada’s Eastern Arctic. It is the story about the three stars in Orion’s belt. Four men were hunting a bear. The bear escaped by climbing into the sky and the hunters decided to follow it. As they climbed higher and higher, one of the Inuit lost a mitten and decided to return to Earth to fetch it. The other hunters continued their hunt in the sky and we can still see them today climbing after the bear in single file. The legend goes on to say that it was the Inuit hunter who returned to Earth to find his mitten who told the story. The Inuit measure the passage of time by using the arrival of the full moon, and their lunar calendar thus has 13 months. The year begins at different times for each Inuit society depending on their latitude, although the signal that marks the New Year is the same for each tribe: it is the moment when the Sun reappears above the horizon after the long polar night. This, of course, explains why the timing varies according the tribe’s northern location. In the beginning, darkness was everywhere. There was no light on Earth, and it was not possible to see the ground, the animals or humans. Strangely enough, however, an animal could transform into a human, and a human into an animal. 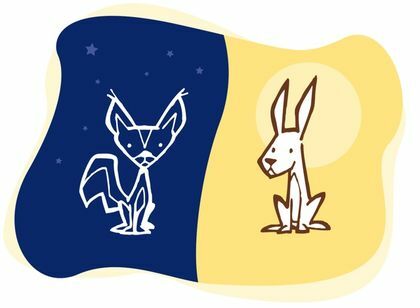 There were several different animals, like bears, hares and foxes, but when these animals became human, they all became the same: they spoke the same language, lived in the same style of home, and hunted the same way. It was during this time that magic words were created. A word mentioned casually during a conversation could suddenly acquire magical powers, and nobody could explain how or why. One day, a fox and a hare were having an argument. The fox kept repeating “Darkness!” because he liked the way he could use the dark to steal the hunting catches of the humans. The hare, on the other hand, kept repeating “Daylight!” because he needed light to help him find food. Suddenly, light shone and darkness fell away to be replaced by day. The word repeated by the hare had stronger magic than the fox’s word. Since then, night and day take turns shining over Earth, and the fox and the hare take turns finding food as well. A long time ago, after the World was created, a great shaman acquired such strong powers that he went to live in the sky. He brought with him his sister – who was very beautiful – and fire. He added so much fuel to the fire that it became the Sun. The brother and sister lived in harmony for a long time until a great disagreement arose between them and the brother hit the sister, marking her face with a disfiguring burn. The young woman left her brother to take refuge elsewhere in the sky where she became the Moon. Since then, the brother and his fire have followed her, trying to reach her, but never succeeding. A powerful angakoq (shaman) decided to visit the Moon. At his request, his hands were tied with a leather cord and the lamps in his home were extinguished. The shaman then prayed to his tormaq (spirit guide) to transport him to the Moon, and the spirit complied. The couple began to dance before the shaman. To his great surprise, he saw that the Sun-Woman had no back, no spine and no entrails; only a heart and lungs occupied her chest. The dance was very strange and the faces made by the couple so peculiar that the shaman ran away lest he should laugh. Soon after, the shaman decided to return to the house, determined not to laugh. Once the dance had ended, the Moon-Man graciously welcomed him and invited him to visit his home. In one room, the shaman saw large herds of deer that roamed over vast plains. In another room, he saw many pods of seals swimming in the ocean. The Moon-Man let the shaman choose one of each as a gift. When he arrived back on Earth, the body of the shaman – which had remained completely still and spiritless – began to revive. Much to the surprise of everyone, his hands had been untied despite the fact that nobody had touched him. The shaman told them his story of what he had seen on the Moon. A young orphan lived with a family that treated him badly. He slept in the entrance tunnel with the dogs and ate only leftovers. Only the youngest of the Girls in the home treated him well. One night, while he lay on the ground staring up at the Moon, he thought of ways to escape. The more he stared at the Moon, the more convinced he became the he was staring at a human face. He was so certain the face was real that he pleaded to the Moon-Man to help him escape. The Moon-Man heard him and descended to Earth. He took the young orphan with him onto the beach where he flogged him with a whip. With each crack of the whip across his body, the boy became stronger and bigger. 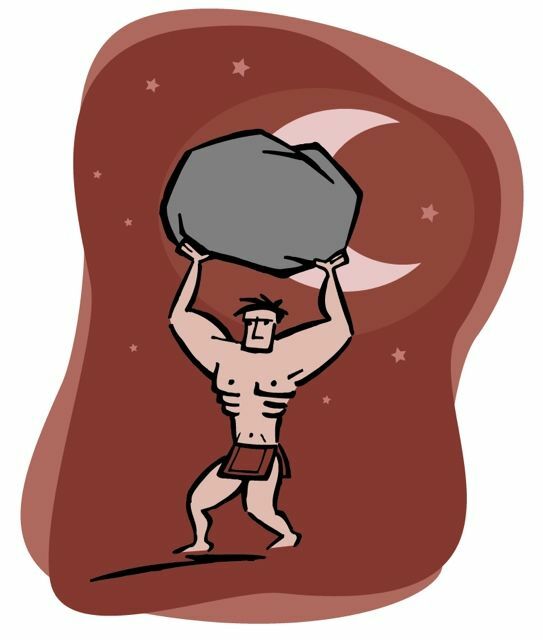 The Moon-Man returned to the sky when he had finished, and the orphan stayed on the beach all night, lifting large rocks and throwing them as far as he could. In the morning, the boy returned to the house and struck down all those who had been cruel to him, with the exception of the kind young Girl. She became his wife, and he became the leader of the village.